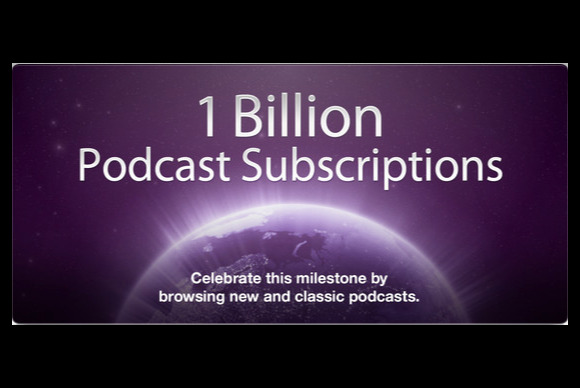 No doubt about it: A billion podcast subscriptions is a massive number. No doubt some of those subscriptions don’t translate into nearly as many “listens”; if you’ve ever had newspapers or Instapaper articles accumulate over time, you know how a podcast subscription can get. Either way, though, the milestone is significant. And it’s even significant that Apple’s touting the number. When Apple crows about the number of iPhones sold, apps downloaded, or OS X updates installed, that’s direct pride in profitable Cupertino creations. Though the word itself evolved etymologically from “iPod," podcasts aren't an Apple invention, and the company doesn’t directly make money off them, either. At the same time, the company’s heavily invested in the medium: There’s the iTunes Podcasts section, complete with an editorial staff that curates it; the ever-evolving Podcasts app for iOS; and even the Apple TV's built-in podcast support. GarageBand offers explicit support for creating podcasts, too. Making it easy to create, discover, and subscribe to podcasts makes Apple’s customers happy. And it makes podcast providers happy too. “We’ve been podcasting basically since the iPod came out in 2001,” Zach Brand, vice president of digital media for NPR, told Macworld. NPR has consistently been one of the most popular podcast providers in the iTunes Store, and now sees more than 25 million downloads of its podcasts each month. “Obviously, podcasting is a very natural fit for our audio focus,” Brand said. And podcasting helps NPR fulfill its mission. “Our audience loves listening to our content through podcasting, and we love delivering it. We like to engage our audience on whatever platform they choose to listen,” Brand said. Brand says that the vast majority of NPR’s podcast subscribers come through iTunes, and that most listeners are using Apple-made technology to listen, whether it be iTunes, the Podcasts app, or simply an iOS device running a third-party podcast listening app.